As hundreds of millions of Chinese migrate home for the new year, Baidu uses cell phone data to create a real time map of human migration. 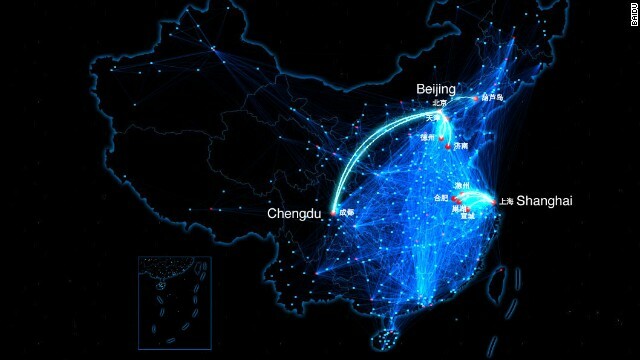 Chinese social network Baidu has developed a moving map of Chinese people as they travel home for Chinese New Year. (CNN) — With a bit of technical ingenuity, Chinese web giant Baidu has developed a moving map of travelers as they return home for Lunar New Year, which begins this week. The map, which updates hourly, works by pulling location data from users’ mobile phones as they travel across the country. Users can click to see which routes and cities have the most traffic at any given moment. The Lunar New Year, also known as spring festival in China, is a hectic time for the country of over 1.3 billion people, as hundreds of millions leave the cities to visit their relatives, many of whom remain in the countryside. Although the country is rapidly urbanizing, a huge number of city-dwelling Chinese are considered migrant workers, and do not enjoy full legal and social rights in urban areas.